I took another Travelling Book to the Embroiderers’ Guild meeting, this one’s theme was ballet. It already had several exquisite embroidered ballerinas and a wonderful depiction of a male Swan, so I went for something different. The backcloth for the 1920s production of the Firebirds has for a long time being one of my favourite images. It was designed for the revival of the ballet in London in 1926 and designed by Natalia Goncharova. 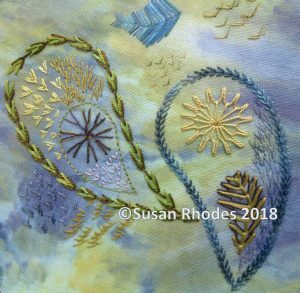 I printed a small part of it onto cotton lawn and added embroidery and gold paint. 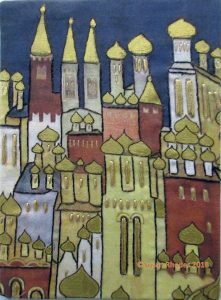 I’m not sure if the original had gold onion domes but I thought they deserved gilding. The meeting was a show-and-tell roundtable. Members brought in work they were doing or had completed and told us all about it. So fascinating to see what others were up to and how very different they all were in design and technique. 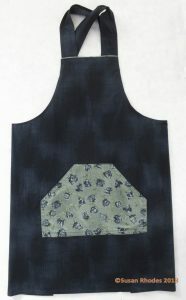 Embroidery really does have something for everyone..
On Saturday, I started, and finished, an apron. I have long wanted one that has the crossover straps at the back and wraps around. I used some beautiful Janet Clare fabric I’ve been saving for something special and I am thoroughly enjoying wearing it. Another completed project – I may be slow but I get there in the end! 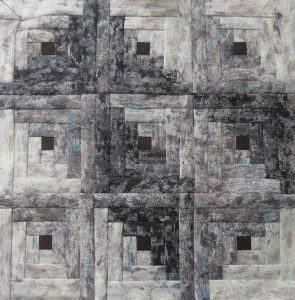 Remember the interleave quilting? 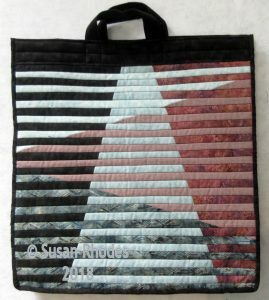 Way back in February I did a panel with my textile group. Three months later and it’s a bag. 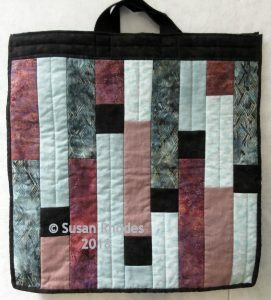 I used some more of the same fabrics and foundation pieced random length strips to create a back panel. Fortunately I had enough of the black to finish off the top edges, make a gusset and then bind the seams. I did these wrong sides together to give a neat black edge to the panels. It ended up being a very large bag and was used on Saturday to carry all my sewing stuff to a great awayday. 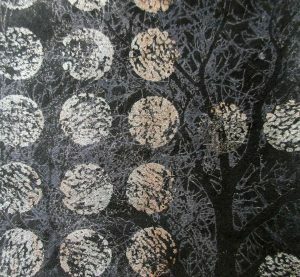 Alex Waylett has an enviable studio near Colchester and offers a wide range of workshops. 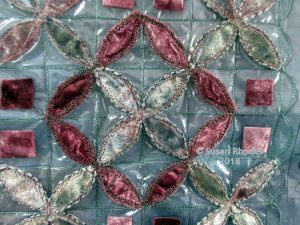 Eight of us, mostly from the Embroiderer’s Guild, convened at 10.00am to experience the delights of layering sheers and silk velvet, machining and embellishing, to produce a grid-based piece of work that we would take home to decorate further with beads, braids and burning. Alex led us gently and clearly through all the various stages and we were so enjoying ourselves that we didn’t leave till well gone four o’clock. I include a detail of my piece but it is very much a work in progress, so watch this space. (It still has the Romeo soluble fabric shining brightly but that will be rinsed away.) Do look at Alex’s work on the web. 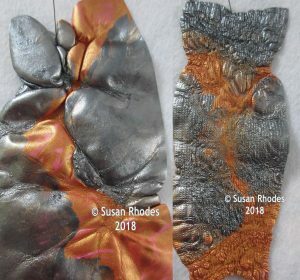 There aren’t any photos on her website of this particular project but you will get an idea of the wonderful pieces she makes and what you might enjoy as a workshop. A very mixed bag of activities since the last entry. 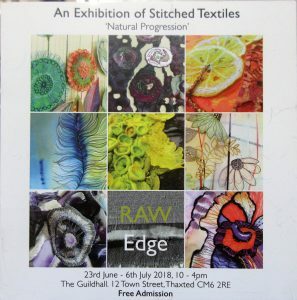 That’s one of the (many) aspects of textiles that I love – you certainly don’t need to be doing the same thing all the time! In my textile group we played with Gelli plates. Two adventurous members made their own; I have a 6 inch square commercial one. We all brought stencils, mark makers and paints and shared them, thoroughly enjoying ourselves. 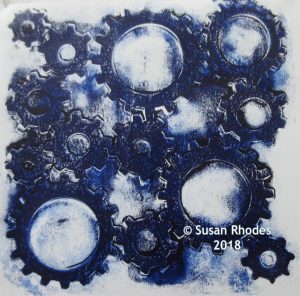 We all produced very different looking prints as it is a very versatile and personal technique. I have been re-acquainting myself with Tyvek’s potential, both the film and the fabric. 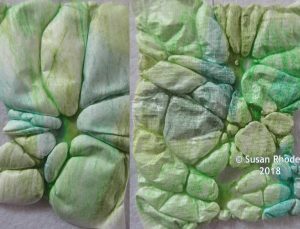 I worked on both with several types of media and decided that I prefer the effects on the fabric. This is also easier to stitch into so that’s what I will stay with. Now to actually use some of them with fabric and embroidery. As you can see from the two examples the fabric Tyvek contracts much more interestingly when subjected to heat. 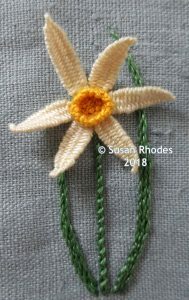 And for something completely different – I hand-embroidered a wild daffodil. It is a contribution to another travelling book, one with the theme of wildflowers. I sat in the garden over our sunny weekend and immersed myself in woven picots and knotting. Late again with my blog but a long, sunny bank holiday weekend spent with children and grandchildren is an excellent reason. Long – time visitors to Threadlines will know I have been, very slowly, working on a bed quilt. 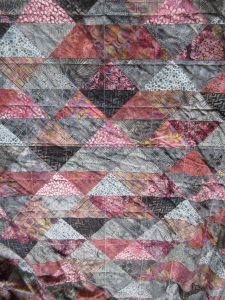 I recently finished piecing and adding borders and was then faced with layering the backing, wadding and top and tacking them together. I have a lower back problem which I treat with the utmost respect; neither stretching across a large table, nor working on my knees on the floor would be sufficiently respectful, I felt. The solution? I took it to Bramble Patch on a visit to my daughter and she returned it to me last weekend, efficiently tacked by a long arm quilter. I’m thrilled. 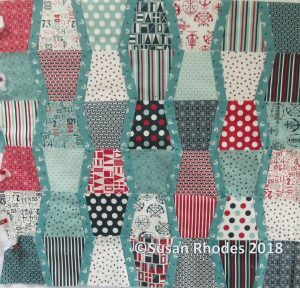 Now it feels like a quilt and looks like a quilt! Next step is wrangling the thing through my standard Bernina to quilt it. Another learning event for me – any tips gratefully received. Some progress on another project; nine log cabin blocks are now a pieced square that will (probably) form the front of a bag with the two orphaned squares functioning as pockets inside. 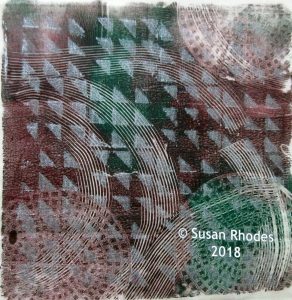 In my workshop this week I demonstrated use of Thermofax screens, particularly for layering and altering commercial fabrics. I had forgotten how much I enjoyed this process and feel the urge to have a day creating more fabrics. I also unearthed some pieces as examples and have an idea to develop some of them.